So what are 'positioning' bass? Positioning bass are those that are 'waiting' or 'holding' in predetermined areas or zones, generally waiting for items of food (prey) to swim near them or for other items (worms, prawns etc.) to be washed unsuspectingly towards them. In the image below, the arrows depict the direction of the flow/current/waves, therefore bringing food items with them. In a similar way to Part 1 of this series 'Depressions' found here, rather than continually travelling with the current, bass will often wait for short periods for the flooding tide and/or wave movement to bring the food to them - before moving on to the next spot. The trick here of course, is that if you can find 2 or 3 of these types of areas within set periods of a tide, then you can sometimes move with the fish. Clearly working out these patterns takes a lot of homework and time. 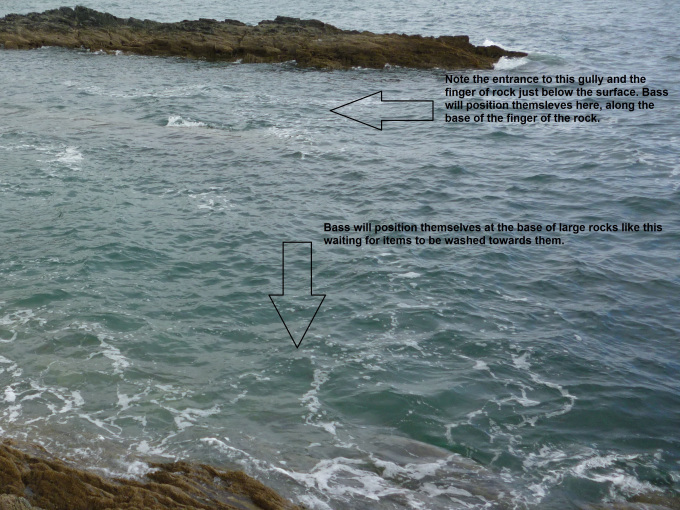 Similarly, in a scenario like this where the reef runs off into a gully (that is running parallel to the main area of rocks) bass will often hold on the ebbing tide, in the knowledge that small fish (gobies etc.) will need to either find a suitable rock pool (to hide in until the tide comes in) or be stranded when the water retreats - this is often why an ebbing tide can be more productive on some marks. An example of a flooding and ebbing tide venue. Other excellent bass holding points can be at the base of fingers, or large areas of rock, exposed to wave and tidal movement. The first image below is of an area of reef where fingers of rock are very prominent. What I have found is that in calm (on a spring tide) or moderate (on a neap tide) wave conditions is that bass will often wait at the base of (tight on the seabed) of such areas. A lure that is cast upstream of these zones and retrieved in as naturally a way as possible (think small surface lures mimicking a wounded, disoriented fish or weightless, weedless lures) towards them, is a very effective way of inducing a take from a bass. Also, don't be afraid to fish over or near to submerged rocks. In the picture of a deeper mark below, where there is a finger of rock just below the surface, I have had many bass on surface lures worked over this, and similar zones - you just have to time bringing the lure over the rock just as a larger wave conceals it. Bass will generally fight on or near the surface (rather than diving for the bottom like a pollack) therefore, lure fishing like this is risky (in that you may lose the odd lure) but very achievable and often rewarding. Furthermore, I remember bait fishing on a mark on the River Yealm a few years ago (before anglers were routinely using weightless weedless lures), where a lugworm trotted down in the flow with the minimum of weight attached accounted for a dozen or so, admittedly small Bass. The fish were simply holding up at the base of a large finger rock that was at a 45 degree angle to the strong current. Remember! - Fish right up to your feet! There is nothing more frustrating than lifting the lure out of the water just as a bass makes that last-ditch attempt to grab it - especially if it's a big one... In the image above, I have hooked many bass that have seemingly appeared out of nowhere. I firmly believe that on this, and similar marks (with a bit of depth immediately in front of you) that the fish are either waiting directly at the base of the rock, or they're slowly swimming extremely close to it - see my post here. Also remember that bass can and will swim in and around rocks/reefs in very rough conditions - something that I will write about in the final part of this series - Predatory Bass. The result you want from a bass fishing session - they're beautiful aren't they! Why do some tackle companies assume that us anglers only want the more powerful longer lure rods? What about the “regular” longer rods?